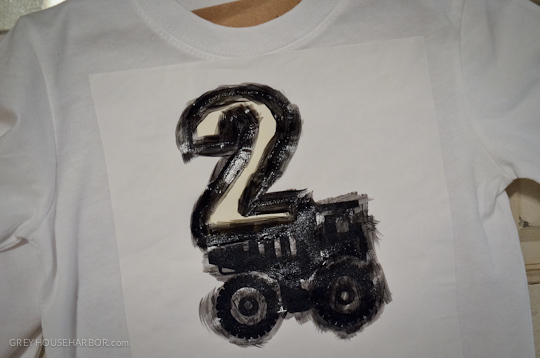 If you’ve been around the blogosphere awhile then freezer paper stenciling is probably old news. But, in the event that someone reading this has no idea what I’m talking about… prepare to have your mind blown! Ready? 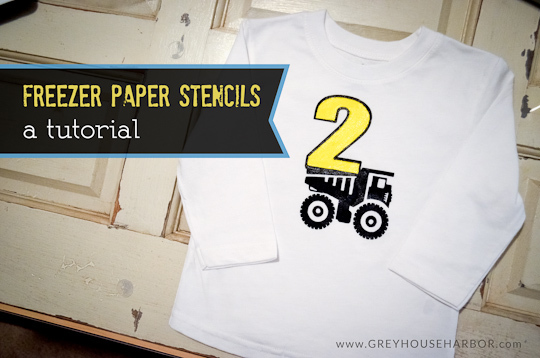 You can make your own entirely custom stencils with a common kitchen item: Freezer Paper! Typically used to wrap meats and what not for freezing, you can find it in the grocery store next to the wax paper and aluminum foil. 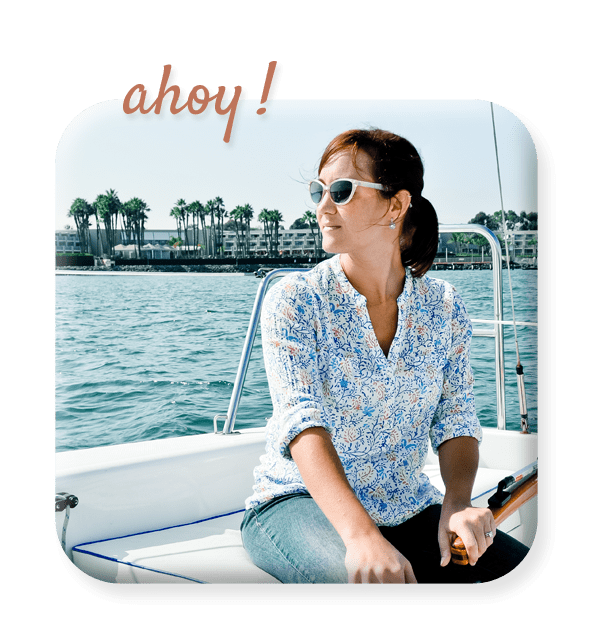 I bought a $6 roll 3 years ago and still haven’t used half of it, so it’s a huge bargain. 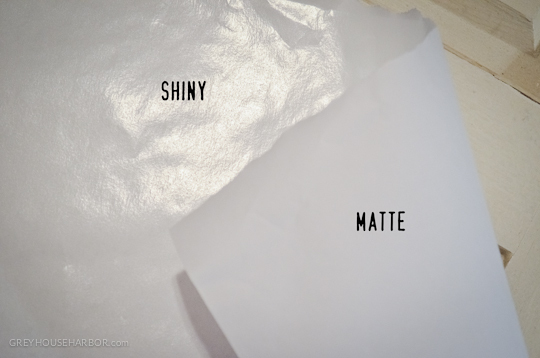 One side is shiny like wax paper and one is matte. 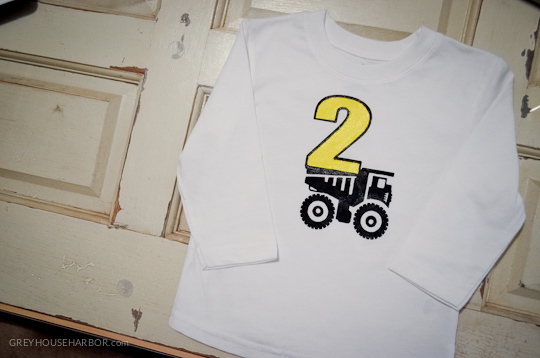 For Bug’s upcoming birthday bash, I wanted to make him a special shirt to match the construction theme. Start by ironing the fabric. If you’re stenciling a shirt, place a brown paper grocery bag or cardboard inside to prevent the paint from bleeding to the back. I designed and cut my stencil with my Silhouette machine. 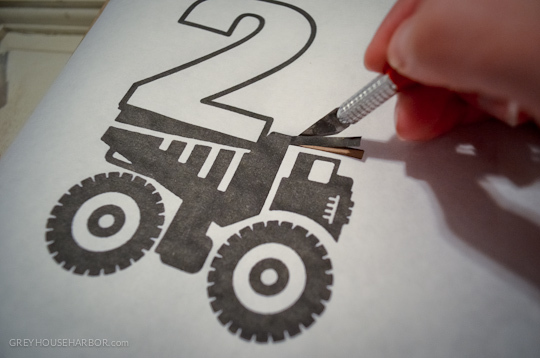 But if you don’t have one of those, print or draw your design on the matte side and cut with an Xacto or scissors. 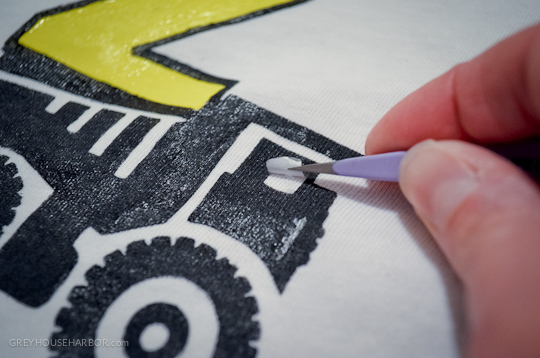 Position your stencil on the fabric shiny side down. 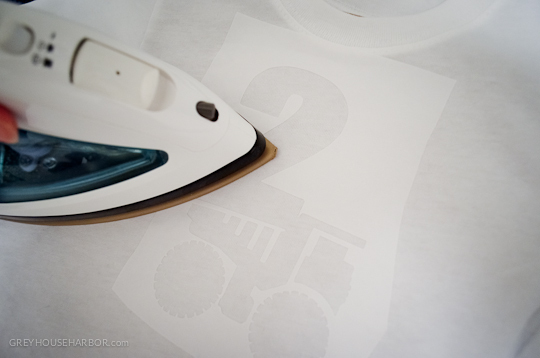 Using an iron on hot with no steam, press the stencil gently. Don’t rub back and forth as this may rip the paper. Continue until all edges are adhered. 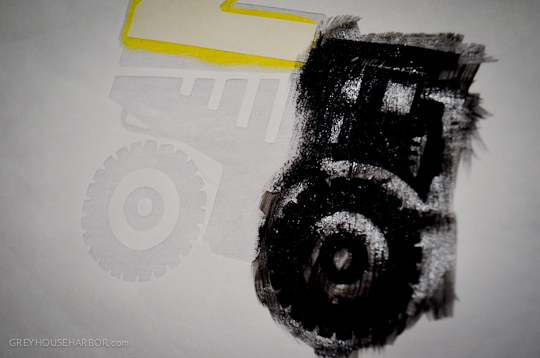 Use an art brush to paint inside the stencil. 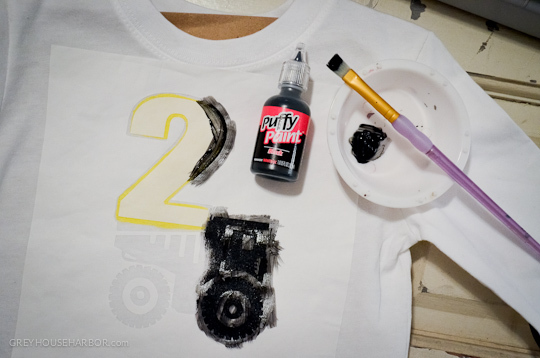 Fabric paint or Puffy Paints work great and are entirely washable. 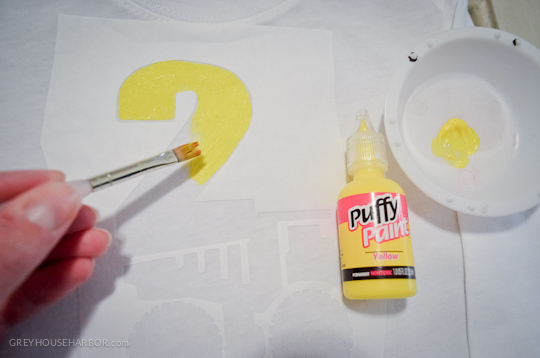 The Puffy Paints won’t be puffy if you brush them, but they will have a slight sheen when dry. For this particular design, I actually made two identical stencils : one to do just the yellow and then one for the black outline. Next time I’d probably just do the outline and then freehand the yellow fill. Continue painting over the entire design. You want solid coverage, so it’s ok to brush onto the matte side – it won’t leak through. At this point it’s SUPER tempting to pull the stencil, but restrain yourself! Not only will the design pull cleaner when completely dry, but it’s also impossible to re-attach it if you missed a spot. 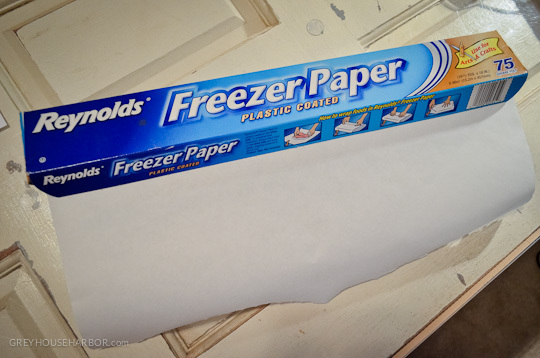 When it’s totally dry, slowly pull up the freezer paper. Tweezers are helpful for stubborn small bits. 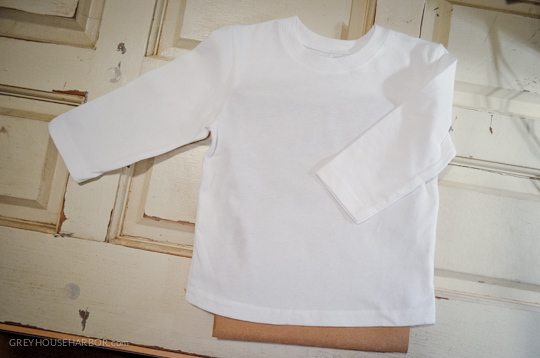 Here’s a few other freezer paper projects from the past couple years. Songbird painted the strawberry herself! 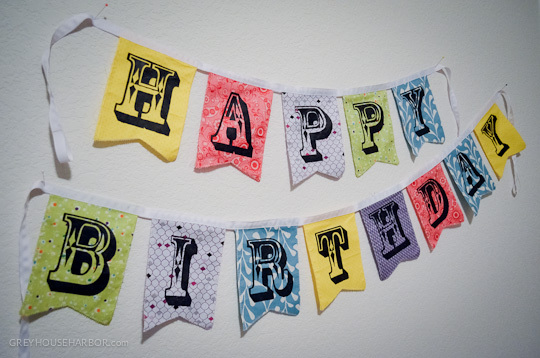 Birthdays, holidays, family reunions, bachelor/bachelorette parties, baby onesies, banners, pillows… the possibilities are endless! Going to try it? I’d love to see what you make. 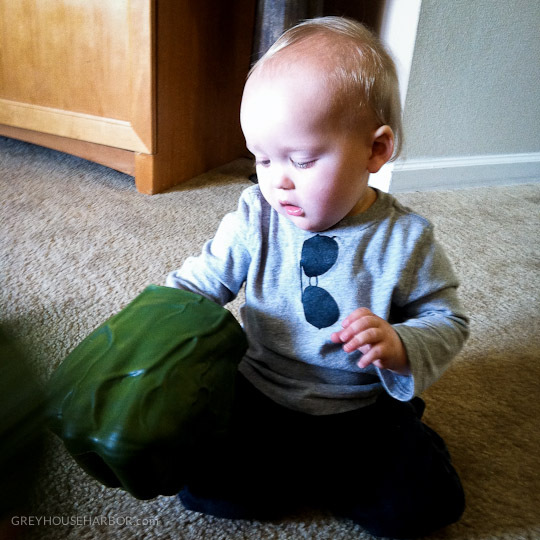 Share a pic on the GreyHouseHarbor Facebook page here. My mind has officially been blown! 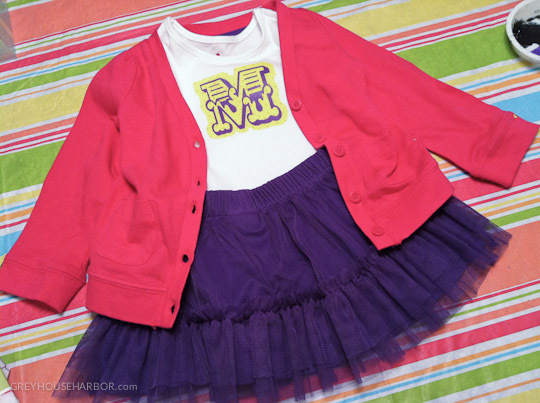 I love that little M shirt and tutu! Is it weird if I dress Lyddie in it too when she is big enough. ;) Can’t believe that little bug is already turning 2!!!! Consider a special “L” version ordered! ;) Or now you know how to DIY! 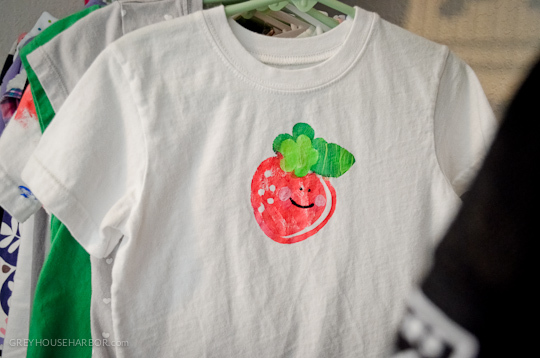 I hadn’t thought about brushing on puffy paint, what a great idea! 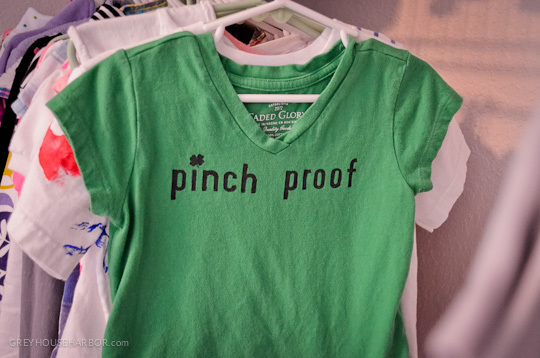 Theresa- if you use fabric paint (puff paint or otherwise) it washes up great! No special care required.